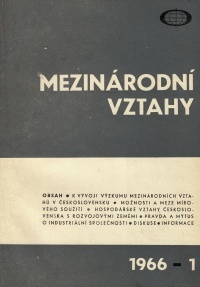 This revue, which is in the hands of readers for the first time, is to be a Czechoslovak periodical devoted to international politics and economics. It will carry studies and articles on scientific analyses of international relations. The editors are convinced that confrontation of various opinions will promote the development of research work in this field. The magazine will appear four times yearly, published by the Institute for International Politics and Economics, in Prague. "International Relations" will contain Russian, English, French and German resumes for interested readers abroad.